Police are seeking two hooded young men after a 15-year-old boy was stabbed to death in an east London street. 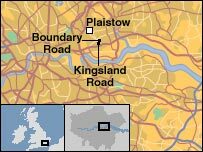 Adam Regis, nephew of former athlete John Regis, collapsed at the junction of Boundary Road and Kingsland Road in Plaistow on Saturday evening. He had been stabbed in the chest and abdomen and died 90 minutes later at nearby Newham General Hospital. A 34-year-old man was also stabbed half a mile away by East Ham tube station in the early hours of Monday. Police have not linked the two stabbings. Det Ch Insp Ian Stevenson, of the Metropolitan Police, said there was "absolutely nothing to indicate that it was a gang-related act". It is understood that earlier in the evening, Adam had been to the Showcase Cinema in Beckton with some friends. They are thought to have travelled back from the cinema by bus, possibly on the 104 or the 376, police said. They got off at about 2100 GMT on Romford Road near Warwick Road, more than a mile from where he was found collapsed. 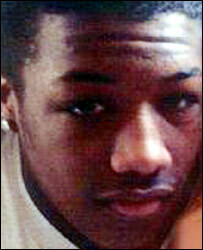 Adam is believed to have then separated from his friends and continued his way home alone. "At some point during this journey he was stabbed - we believe close to where he was found, given the extent of his injuries," a police statement said. Mr Stevenson said two people heard shouting before they found Adam. Local woman Sandra Wynands said she stayed with Adam until the ambulance arrived after finding him. "I did not realise he had been stabbed. I feel for his family," she told BBC News. Friends have since been laying flowers at the scene. A message on a bouquet from his girlfriend read: "I'll never forget you." 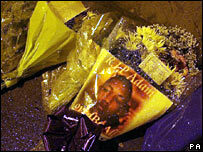 Adam was a year 11 pupil at Kingsford Community school in Beckton, east London, Newham Council said. A council spokesman said: "The whole school community is extremely saddened and shocked by the news of Adam's death." Police are examining CCTV footage including tapes from the bus, conducting house-to-house inquiries and forensic examinations. Adam's cousin Cyrille Regis played international football for England. Mr Stevenson has appealed for two youths seen running near to where Adam was found to come forward as they may hold vital information. "Equally, I would appeal for anyone who may have seen the victim or the two youths in Kingsland Road to contact police," he said. Speaking on Sunday he said: "My thoughts are for the family, it's Mother's Day today, it must be absolutely dreadful for the family." Adam is the second London teenager to die in a knife attack in the past week - Kodjo Yenga, 16, was stabbed to death in Hammersmith, west London, on Wednesday. Pastor William Lamptey, who works with young people in the area, said youth culture played a big role in the violence on the streets. "I think it is the general culture of the youngsters, their behaviour, the way they conduct themselves. "When you see them, the way they dress, they are telling you 'Back off, I'm a hooligan. I'm aloof, you can't talk to me'."